Subunit. Spontaneous mouse mutants help to identify candidate genes for disease mechanisms and have hinted at an important role for ion channels in epilepsy long before the first human channelopathies were identified. The ducky mouse has absence seizures and suffers from ataxia. A truncation mutation in CACNA2D2 could be identified in this phenotype, encoding for an auxiliary calcium channel subunit. This finding emphasizes the role of calcium channels in absence seizures and begs the question whether genetic variation in CACNA2D2 is also involved in human epilepsy. 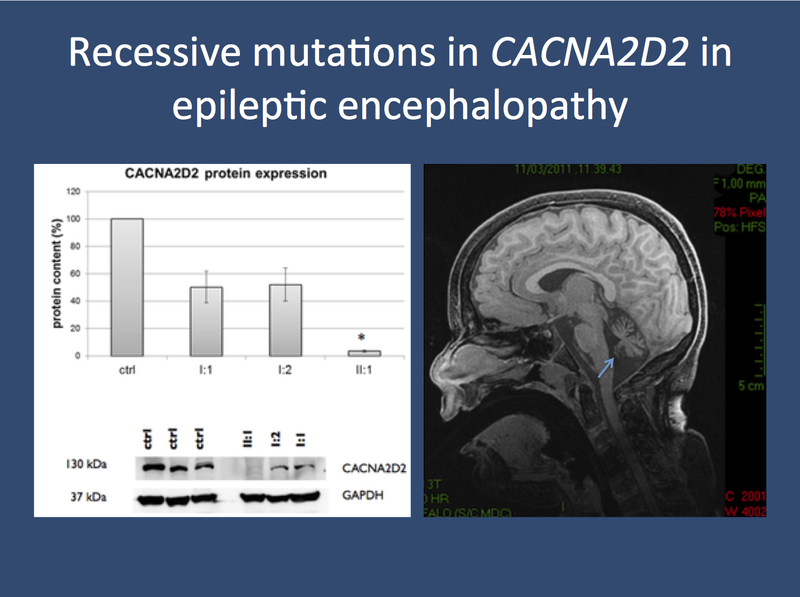 A recent publication in PLOS One now identifies the second recessive CACNA2D2 mutation in a patient with epileptic encephalopathy. But are two independent cases sufficient anymore to claim causality? CACNA1H. Voltage-dependent calcium channels (VDCC) are important for neuronal transmission. Under physiological conditions, the calcium concentration inside the cell is one thousand fold lower than outside. Once VGCC’s are activated, calcium flows into the cell, which results in excitation of neurons, activation of calcium-activated potassium channels and various other physiological responses including up-regulation of gene expression. Functional changes in voltage-dependent calcium channels through genetic variants may lead to neuronal hyperexcitability and to epilepsy. CACNA1H is one of the most prominent epilepsy-associated genes for voltage-dependent calcium channels. Some of the rare variants found in this gene render the calcium channel hyperexcitable. It should be noted, however, that the genetic evidence for the involvement of CACNA1H in absence epilepsy stems from the pre-exome era and might not be considered significant based by current criteria. CACNA1A and others. The alpha 1a subunit of the voltage-dependent calcium channel (CACNA1A) is also involved in autosomal dominant neurological disorders and is implicated in spinocerebellar ataxia type 6, familial hemiplegic migraine with and without cerebellar atrophy, and episodic ataxia. For other calcium channels, there is evidence from spontaneous murine mutations for an involvement in neurological dysfunction and epilepsy. These mouse models include stargazer (CACNG2), lethargic (CACNB4) and ducky (CACNA2D2). The ducky gene CACNA2D2 is the candidate gene that was identified as the possible recessive cause in two families with epileptic encephalopathies. The CACNA2D2 protein is an auxiliary calcium channel subunit that modifies the function of the alpha subunit. The ducky mouse has ataxia and absence epilepsy. Exome to CACNA2D2. The first report of CACNA2D2 as a possible cause for epileptic encephalopathy was from the study by Edvardson and collaborators. They identified a homozygous mutation in three sibs affected with epileptic encephalopathy from a consanguineous Palestinian family. However, the authors were not able to pinpoint the causal mutation, as a neighboring gene, CELSR3, also carried a previously not described variant. The authors resorted to functional studies to show that membrane expression of other calcium channels was impaired by the CACNA2D2 mutation they identified. Now, Pippucci and collaborators present another case with a homozygous CACNA2D2 mutation. The patient had severe developmental delay and developed left-sided focal seizures and tonic seizures at the age of 5 months. The EEG showed multifocal epileptiform discharges, but no hypsarrhythmia. Later, the patient developed brief dyscognitive seizures and nocturnal generalized tonic-clonic seizures. Extensive work-up was inconclusive, and MRI showed marked cerebellar atrophy. The identified mutation in CACNA2D2 was a null mutation due to a single base deletion, resulting in a markedly reduced expression and virtually absent protein expression. Again, the CACNA2D2 mutation was accompanied by a rare CELSR3 variant that was predicted to be functionally relevant. Is CACNA2D2 an epilepsy gene? Let’s summarize the state of knowledge. CACNA2D2 is a good candidate based on an animal model. Two families with recessive mutations have been described with epilepsy phenotypes that have shared features, but do not show a similar pattern that stands out. In both cases, proving the causative nature of the CACNA2D2 mutation based on genetics alone has been difficult, also due to linked, functionally relevant variants in a neighboring gene. This raises the question whether these two findings are sufficient to demonstrate that CACNA2D2 is a confirmed gene for epileptic encephalopathies. On a more abstract level, do two findings make an epilepsy gene or do we require additional evidence for this? We have already become skeptical of the “double hit” strategy for de novo mutations. Following the same logic, caution might also be warranted for recessive findings. The basic question is: Given that exome sequencing was performed, how likely is it that both findings might have arisen by chance? Chance. I admit that I do not have the answer how likely two independent CACNA2D2 mutations are to be found by chance. Recessive mutations in this gene cannot be found in existing databases or available data in other patients with epileptic encephalopathies, suggesting that mutations in this gene are not common findings in exomes. A ranking of recessive genes intolerant to mutations in parallel to the RVIS would help make sense of these findings. Taken together, the paper by Pippucci and collaborators makes a good case for a causative role of CACNA2D2 in human epilepsy and also highlights our current difficulties in interpreting genetic data once family studies move from single gene studies to exome sequencing. To put it differently: we have to reconsider what it takes to be an epilepsy gene. This entry was posted in 2014, Bioinformatics, Epileptic encephalopathy, Familial epilepsies, Papers and tagged absence epilepsy, absence seizures, CACNA1A, CACNA1C, CACNA1G, CACNA1H, CACNA2D2, CACNB4, CACNG2, calcium channel, calcium channels, cerebellar atrophy, developmental delay, ducky, epileptic encephalopathy, episodic ataxia, familial hemiplegic migraine, lethargic, RVIS, spinocerebellar ataxia type 6, stargazer, voltage-dependent calcium channel. Bookmark the permalink.